Intel’s latest CPUs and Z370 Chipset officially launched last week. Most of you have probably seen or read several reviews already about the new Core i7-8700K, Core i5 and Core i3 CPUs; as well as several Z370 motherboards from Asus, Gigabyte, MSI and ASRock. Most of these new Z370 motherboards continue the trend, with more RGB, more eye candy, trying to outshine the competition. Well, EVGA seems to be doing quite the opposite; instead they stick with a simple looking design, plain black with silver I/O shield, and on top of that no RGB in sight. I think EVGA is focusing on quality and stability rather than eye candy. EVGA’s new Z370 Series motherboards include the Z370 Classified K, Z370 FTW and Z370 Micro. All three motherboards are designed for the latest Intel 8th gen Core i7/i5/i3 Coffee Lake-S processors, with Intel Optane Memory feature and more. Check out more features and specs below. On top of EVGA’s new 300 series motherboard is the EVGA Z370 Classified K motherboard, offering power, performance and stability with its “highly-efficient” 13 Phase Digital VRM. This motherboard supports Intel’s latest 8th Gen Coffee Lake-S CPUs, paired with 4 DIMM dual channel DDR4 slots that can support up to 4133MH+ memory speed and up to 64GB of capacity. The Z370 Classified K also features EVGA GUI BIOS, Dual BIOS, External Clock Gen, and Killer DoubleShot Pro Gigabit Ethernet. It also features Creative Sound Core3D 5.1 audio and HDMI 2.0 and DisplayPort 1.2 video outputs. This is the only EVGA Z370 motherboard that has RGB lighting on the I/O cover that synchronizes with the onboard RGB headers. By the way, the HDMI 2.0 port allows 4K gaming or streaming at 60fps with supported Intel HD Graphics. Up next is the EVGA Z370 FTW motherboard, a trimmed down version of the Classified K but share the same look, layout and design. It’s not as beefy compared to the Z370 Classified K, but it has the essential set of features that a user would need for a high-performance gaming or work machine. Like the Classified K, the Z370 FTW features a number of USB ports from USB 3.0 up to USB 3.1 with both Type-A and Type-C ports. It also has useful onboard tools like Clear CMOS, power and reset buttons; as well as onboard CPU temperature monitor and switchable dual BIOS. The difference from the Classified K is that it only has HDMI 1.4, 11 Phase Digital VRM, Realtek ALC1220 Audio and one Intel i219V Gigabit Ethernet. 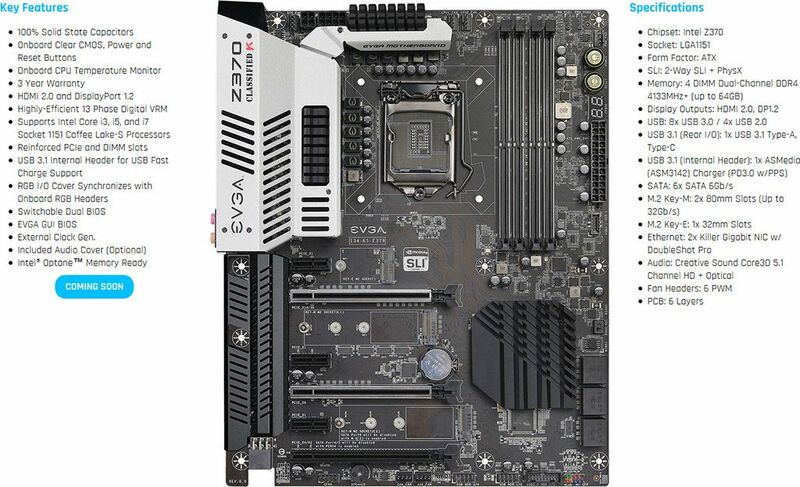 Of course, expect the EVGA Z370 FTW to be cheaper compared to the Z370 Classified K.
Finally, EVGA has the Z370 Micro mATX motherboard, featuring 11 Phase digital VRM, RGB header support, Intel Gigabit with Intel 802.11AC WiFi + Bluetooth wireless connection and other similar features you can see on the Z370 FTW motherboard. The Z370 Micro is the cheapest in the series, and it’s also a (very) plain looking mATX Z370 motherboard. 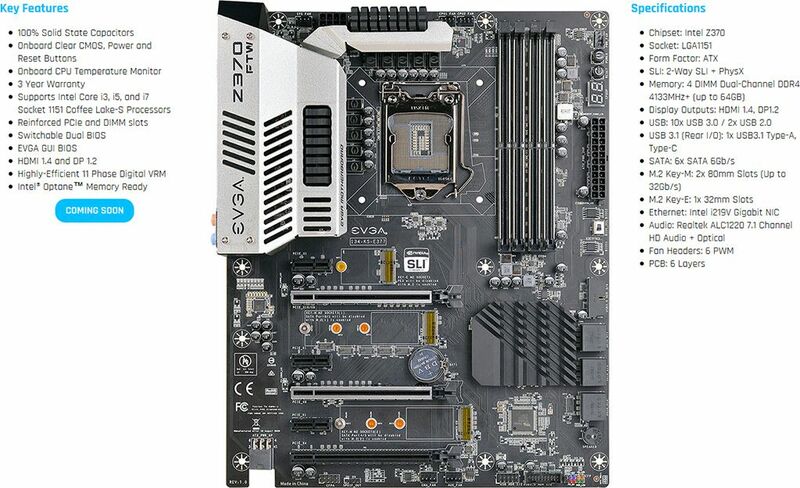 If there’s something I like about this motherboard is that the 24-pin ATX power is angled and has a cut out for better cable management; as well as the headers and 6-pin power connector on the bottom for multi-GPU configuration. As of today, EVGA hasn’t revealed the pricing of these motherboards and we don’t know yet when will these motherboards hit store shelves. Hopefully, they will become available by next month or towards the end of this year.